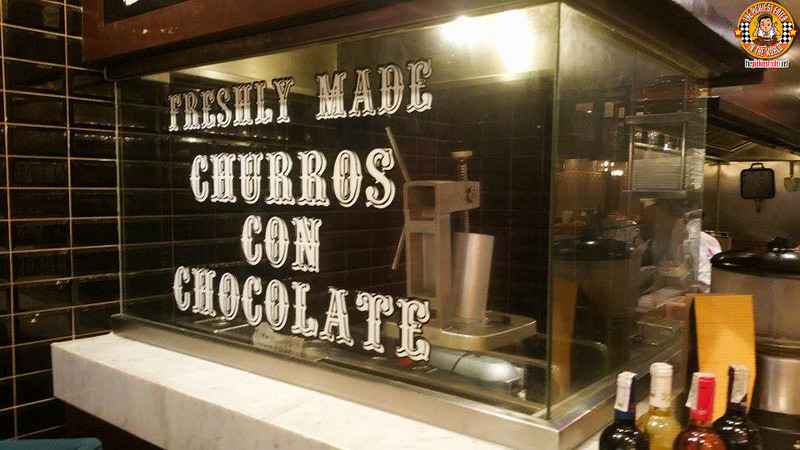 As I stepped into the store, the first thing that I saw was the sign of "Freshly Made Churros Con Chocolate" emblazoned on the glass panel at the front of the store. Considering that Alqueria currently has a Half Off Promo for their Churros, this was a vision of beauty. At the helm of Alqueria's Kitchen, is the well traveled Executive Chef Chris Oronce, who has served in some of the most high profile restaurants in the United States, including Mesa Grill at Caesar's Palace in Las Vegas, where he worked with Celebrity Chef, Bobby Flay. 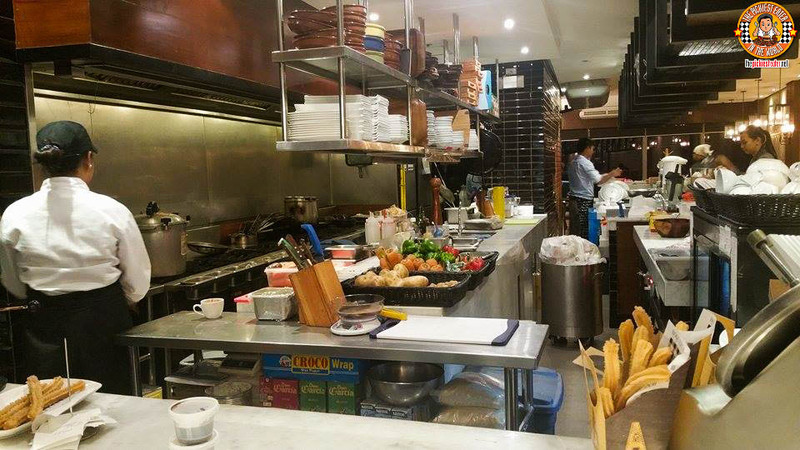 Alqueria utilizes an open kitchen, giving their patrons a glimpse of the action that happens behind the scenes. 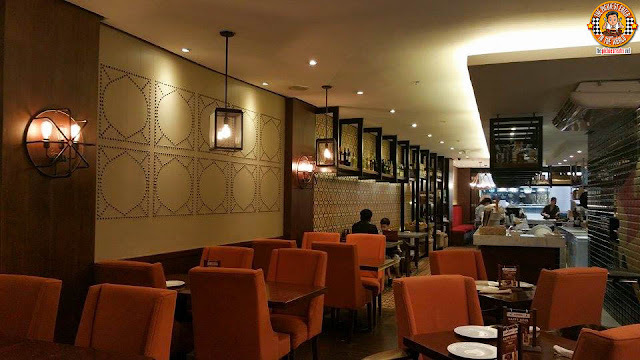 Intricate care goes into the execution of every dish that leaves the kitchen of Alqueria, which is why Executive Chef Chris Oronce is unfazed by the thought being under the watchful eye of his customers. In fact, he more than welcomes it. 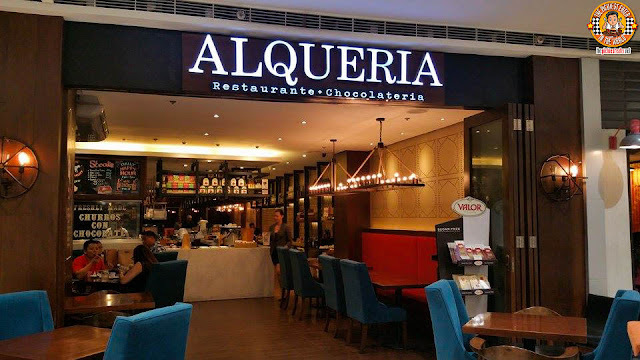 Alqueria offers a sophisticated dining experience not usually found in Mega Mall, yet without the stiffness of a fine dining restaurant. Gorgeous touches of Spanish influenced decors helps set the mood for a wonderful Spanish meal. My friends began the meal by tearing into the Cangrejo Con Jamon Serrano (P250). 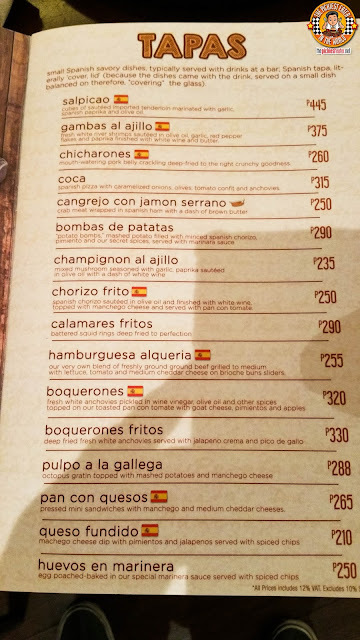 Being part Spanish, I knew that "Cangrejo" meant crab (just kidding, there's a resto with the same name in QC), so I knew there would be the presence of Crab Meat in the dish. I was wary to try it because of my allergies to Shell Fish, so I gladly gave my portion to my buddy Dude4Food, who happily gobbled it up. It must have been good because Hefty Foodie, who has been sent to the hospital in the past due to shellfish allergies, get plowing into the dish with reckless abandon. 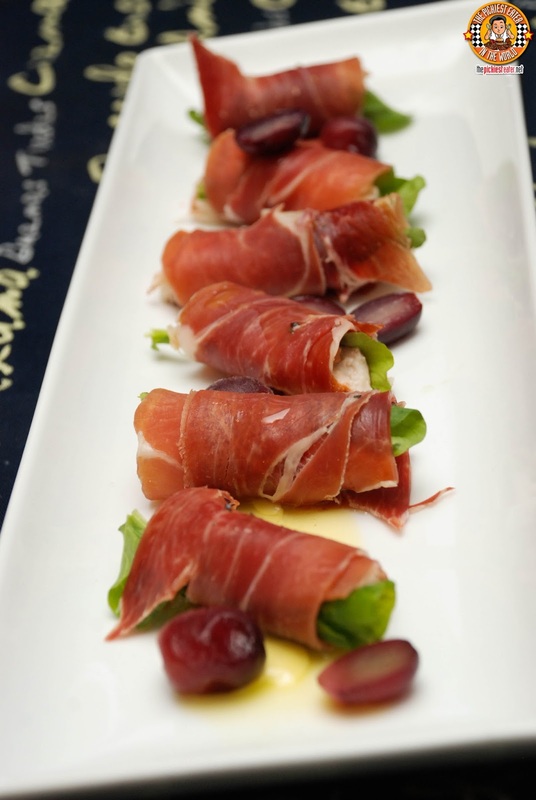 The juicy crab meat is wrapped in a salty Spanish Ham, given balance by a dash of Brown Butter. 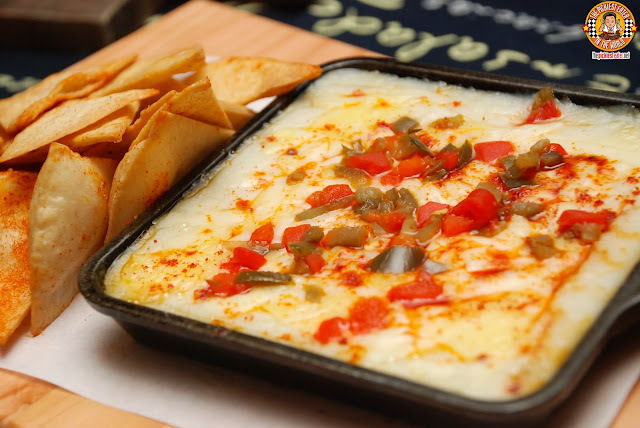 The Queso Fundido (P210) was more to my liking. A creamy Machego Cheese Dip, speckled with vibrant pimientos and Jalapenos for a touch of heat, is presented on a skillet and served with Spiced Chips. After the Chips ran out, me and my friend, J, aka "The Daddist", found ourselves slathering the dip onto anything else we could find, just so we could chow down what was left of it. 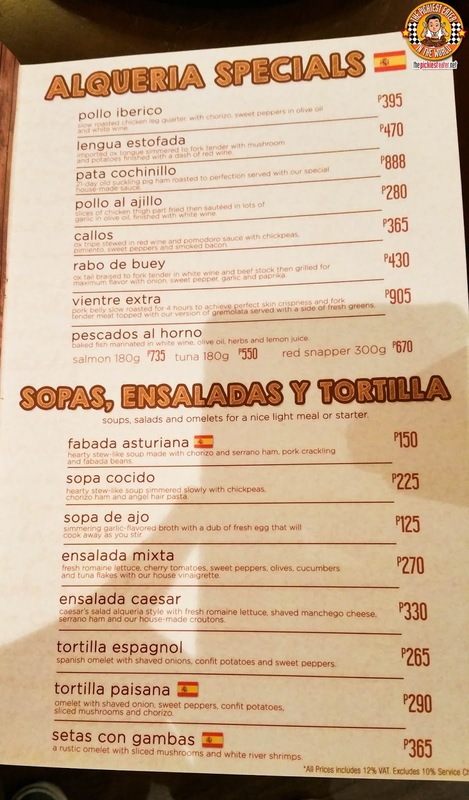 As soon as I saw the Salpicao (P445), I knew that Rina would regret not being able join us, because Alqueria's version was quite excellent. Succulent cubes of deliciously sauteed imported Tenderloin, bathed in a garlic marinade, and spiced with Spanish Paprika and Olive Oil. Every bite seemed to melt in your mouth, and the olive oil-garlic sauce was like a meal in itself, pairing well with virtually anything.. Bread.. Rice.. you name it. I believe I've mentioned in the past that I consider myself a Paella Snob, because Paella is one of my family's trademark dishes. I grew up on the stuff, and every version that someone in my family has made (especially my aunt), is excellent. Alqueria's Paella Valenciana (S - P560/M - P910/L - P1,480) is among the better ones I've tried from a local restaurant in a long time. 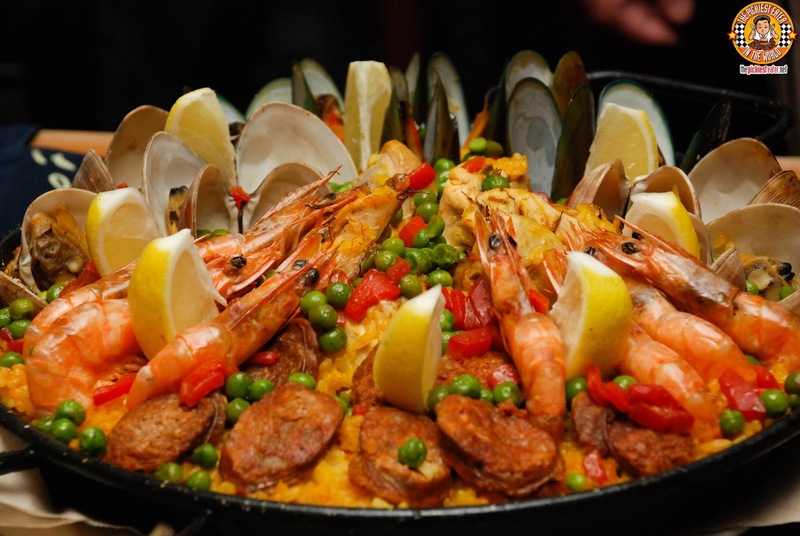 The paella skillet is overflowing with a medley of seafood and vegetables, so you know they didn't scrimp on ingredients. The rice is simmered in a saffron infused stock, then topped with generous heapings of Clams, Shrimps, Mussels, Chicken and Spanish Chorizo. The room got quiet all of a sudden once they brought out the Pata Cochinillo (P888). A 21 day old suckling Pig, Ham roasted to golden, crackling perfection served with our special house made sauce. The meat itself maintained an uncanny level of juiciness that belied the crispiness of its skin. Something you definitely must not miss! Many were surprised to hear that one of my favorite dishes of the evening was the Pescados Al Horno (Salmon P745 180g/ Tuna 550g/Red Snapper P670 300g). A delicious Red Snapper is marinaded in a bath of white wine, Garlic, Olive Oil, and Lemon Juice, then stuffed with herbs, then baked to an immaculate white. This was really amazing and hit all the right notes with my taste buds. 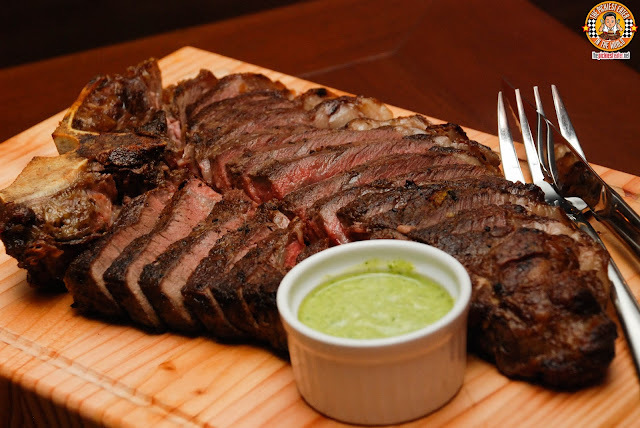 For the knockout punch, Alqueria served their Porterhouse steak, which incidentally isn't on the menu, but you may ask your waiter for its availability. 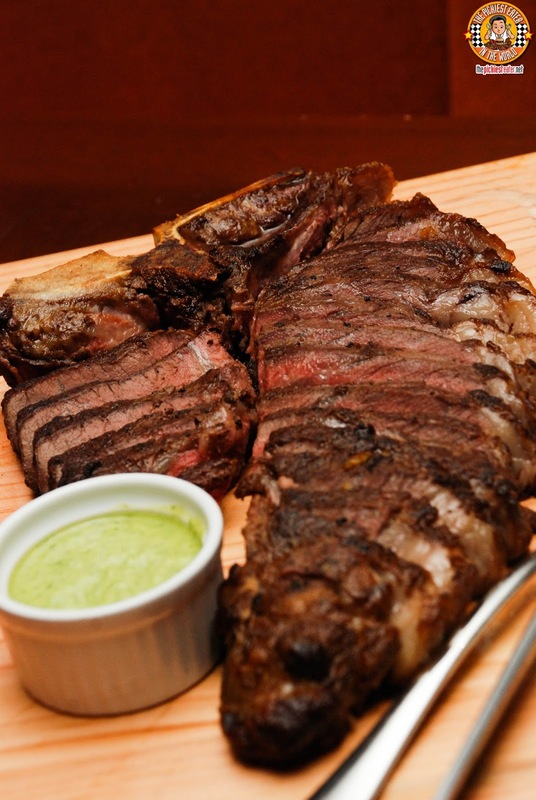 Alqueria uses Prime cuts of meat, and their bone in Porterhouse Steak is absolutely mouthwatering. 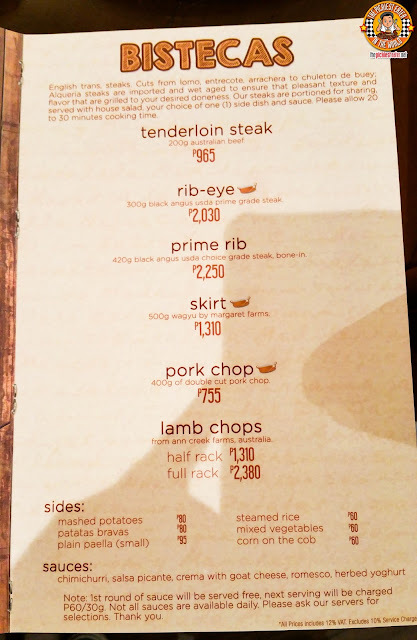 The beautiful lining of fat on the side ensure the meat would have an innate moistness that would help enhance the natural flavor of the beef. You may choose between Chimichurri, Salsa Picante, Creama with Goat Cheese, Romesco or Herbed Yogurt as your sauce. We had the Chimichurri, and it went together perfectly, but truth be told, the steak didn't need a sauce. The beef was the star, and it was amazing. I'm a huge fan of Churros, so I knew that I'd be having a whole bunch of this before the evening ended - and was I right. 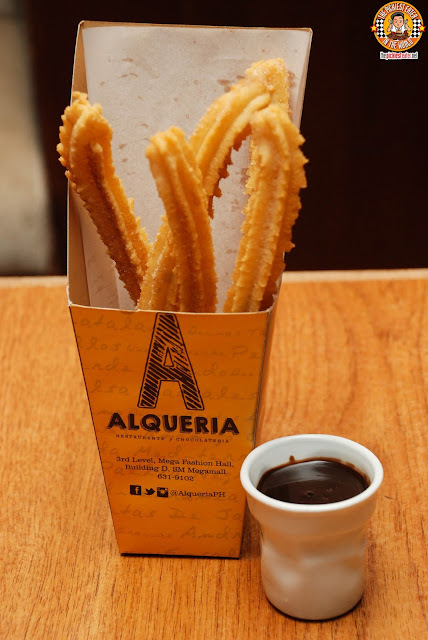 Alqueria serves delicious Churros con Chocolate (3 pcs (P88)/5 pcs (P108)/10 pcs (P198)), that is available with either Dark Chocolate and White Chocolate Dips. We were served an amazing dessert in the form of the Manchego Cheesecake (P280). 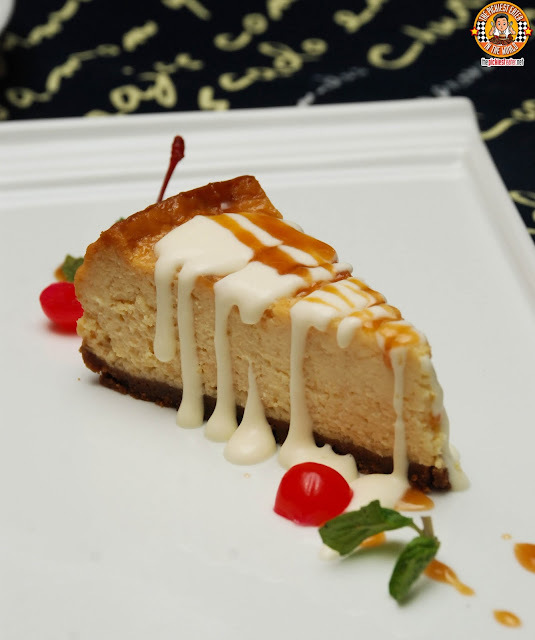 This stunning cheesecake is made with a rich Manchego Cheese, and drizzling of cream cheese, topped with even more melted Manchego. Simply incredible. We finished the evening with the Crema Catalana (P138), which is a traditional Iberian Classic Dessert, made with a custard and caramel sauce. 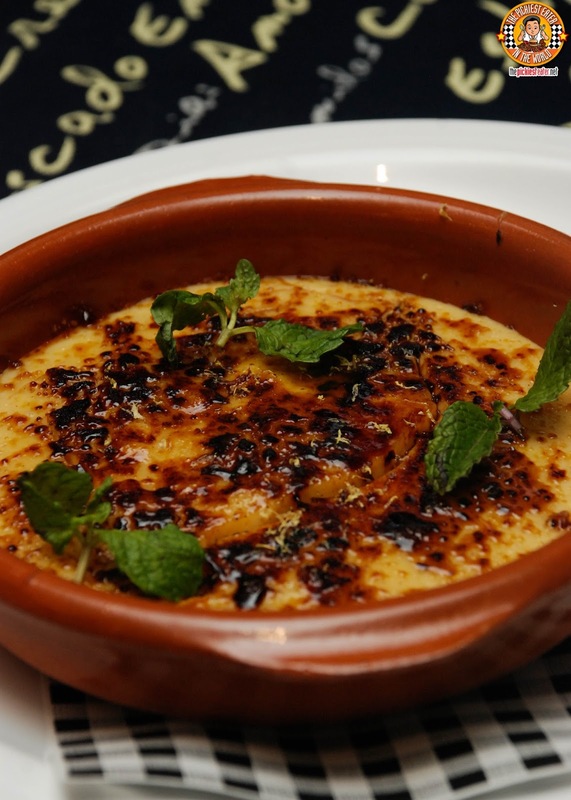 Similar to Creme Brulee, The creamy dessert had a torched crust exterior to go with its gentle touch of tartness that added a little bit of a zing to the dish. Cheers to General Manager of Alqueria, Tony Ortiz, as well as Executive Chef Chris Oronce for a phenomenal job in instantly making Alqueria one of the Spanish restaurants to be reckoned with, in such a short amount of time. 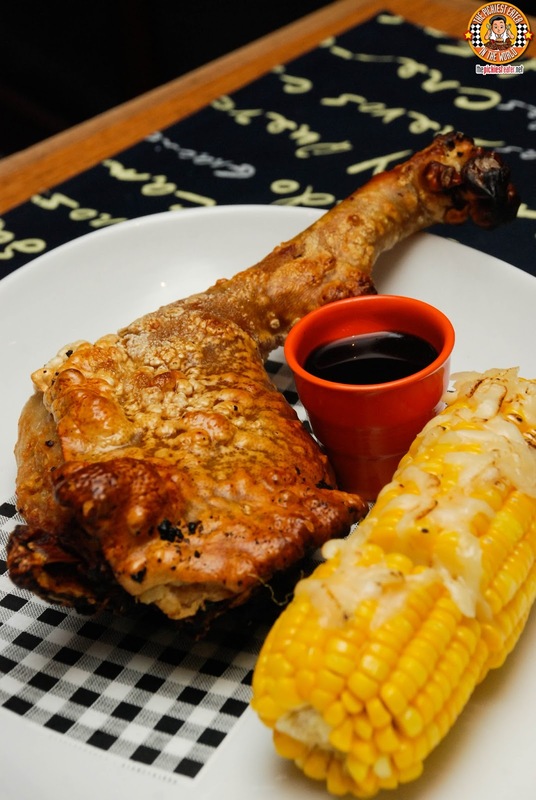 Another hit from the Sumo Sam Group of Restaurants! 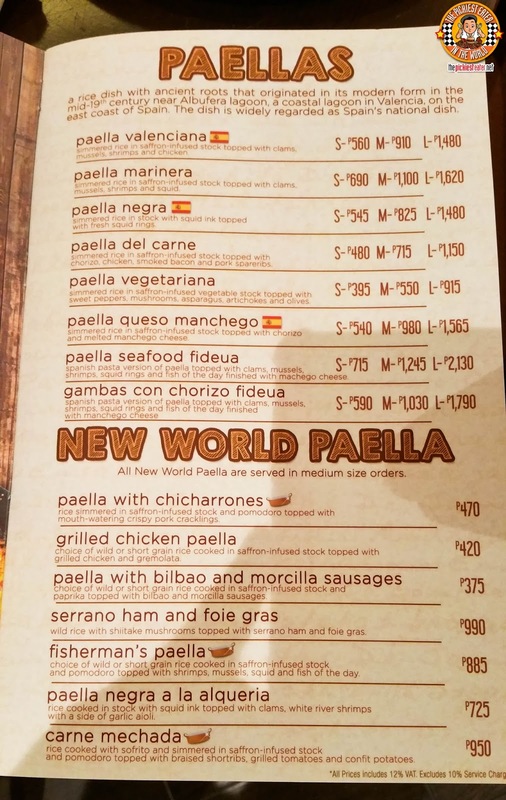 Alqueria Tapas, Paellas and Bistecas, is definitely a restaurant I'd love to go back to again! So much more dishes for me to try, I wouldn't know where to start! It's always a riot with these guys, and our dinner at Alqueria was one of the ages! 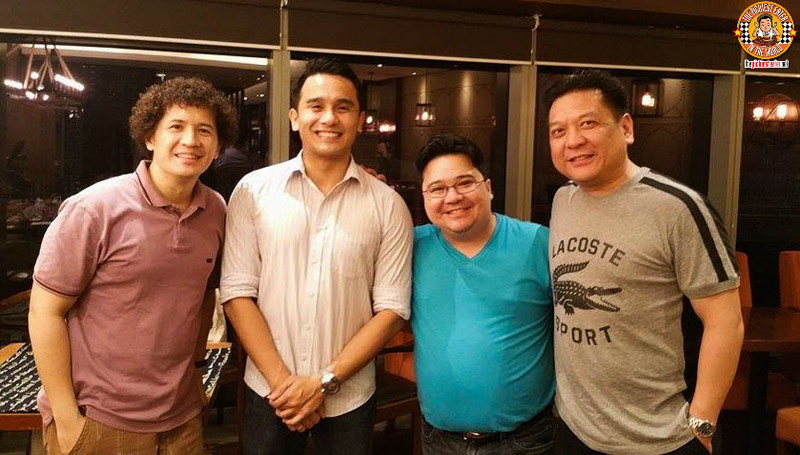 Dining together is always a treat when there's good vibes all around! We missed you Spanky, Franny, Abet, Joan and Yedylicious! I think Rina and I have the same palette. 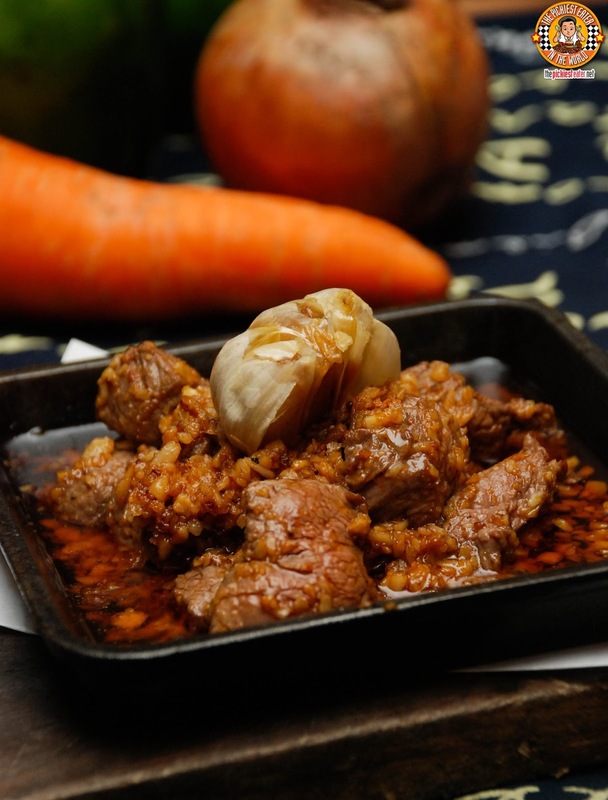 That SALPICAO! Now that you mentioned it, I haven't been to a Spanish resto and I haven't eaten at SM Mega Fashion Hall. I am going to try and ask some friends to try this out with me. 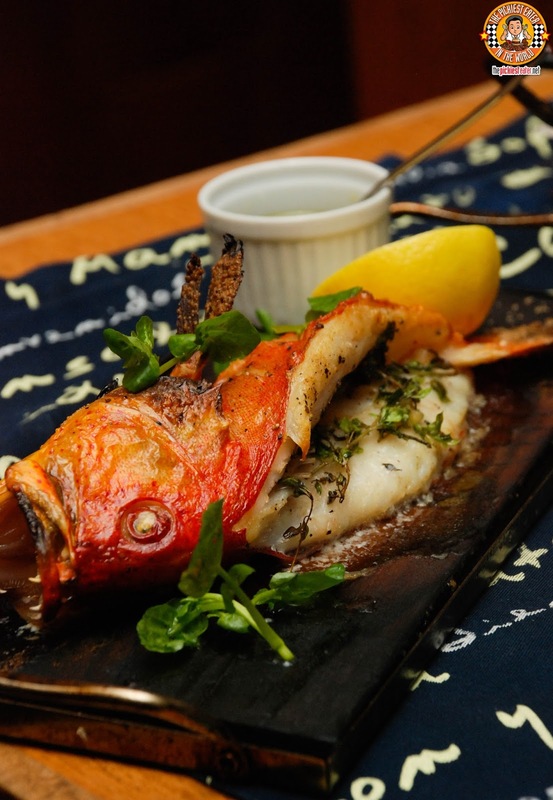 I'm definitely trying that Pescados Al Horno. Lemme know if u wanna blog about it, Marge!